Joseph F. Abely, Jr., age 87, of Sea Island, Georgia and Osterville, Massachusetts, passed away Tuesday, May 31, 2016. Joe was born on January 22, 1929, in Arlington, Massachusetts and grew up in Belmont. He was the son of Joseph F. and Nora (Coffey) Abely. A graduate of Boston College Class of 1950, Joe earned a Masters in Business Administration from Harvard Business School and a JD from Harvard Law School. He served in the United States Air Force and went on to have a long career in senior executive positions in companies such as W.R. Grace, General Foods, RJR Industries and SeaLand Corporation, where he served as Chairman and Chief Executive Officer until his retirement. He also served on the Boards of Directors of entities including Burlington Industries, Bard Pharmaceuticals, Nations Bank, Applera and Perkin-Elmer. He was also a member of the American Red Cross Blood Services Committee. Joe and his wife Brenda were loyal and generous benefactors of Boston College. 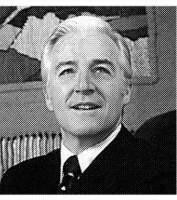 Joe served as a BC trustee from 1976-1983 and 1985-1993, including serving on its Executive Committee. Joe often said that he learned his trade at Harvard but was educated at Boston College. An avid and enthusiastic golfer, Joe had been a member of Oyster Harbors Club, Wianno Club, Winchester Country Club, Ocean Forest, Sea Island Club, Baltusrol Golf Club, Woodway Country Club and The Beach Club. He was also a proud member of the Knights of Malta. Joe is survived by his loving wife of almost 59 years, Brenda Conlon Abely, and their children, James Christopher Abely of Sea Island, GA and Washington, DC and Karen Latham of St. Simons, GA and his granddaughters Kimberly and Caroline Latham. Joe was also the beloved brother of the late William F. Abely and the late John K. Abely. He is also survived by many nieces and nephews to whom he served as a loyal and valued mentor. A private service will be held in Sea Island Georgia. A memorial service will be held in Boston-area later this summer. Donations may be made in Joe Abelys memory to Hospice of the Golden Isles, 1692 Glynco Pkwy., Brunswick, GA 31525. Online guestbook at gfdoherty.com. Services handled by George F. Doherty & Sons Funeral Home, Wellesley, MA.